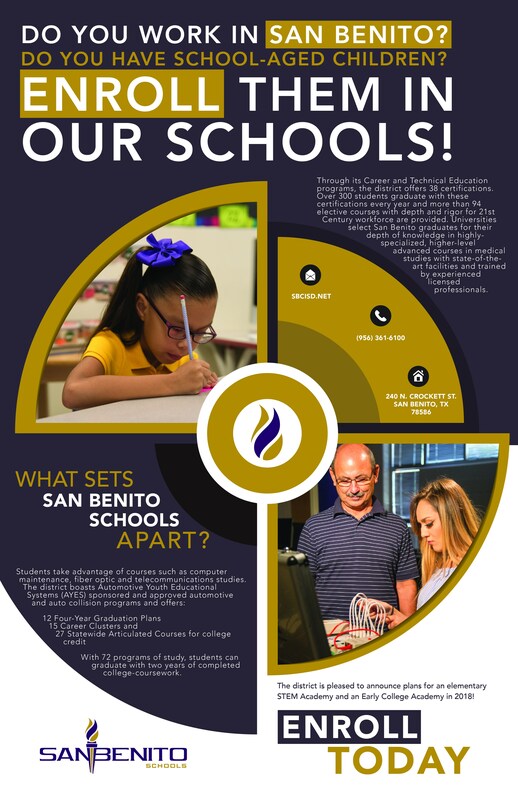 What sets San Benito Schools Apart? Do you work in San Benito? Do you have school-aged children? ENROLL THEM IN OUR SCHOOLS! Through its Career and Technical Education programs, the district offers 38 certifications. Over 300 students graduate with these certifications every year and more than 94 elective courses with depth and rigor for 21st Century workforce are provided. Universities select San Benito graduates for their depth of knowledge in highly specialized, higher-level advanced courses in medical studies with state-of-the-art facilities and trained by experienced licensed professionals. With 72 programs of study, students can graduate with two years of completed college-coursework.